A great Winter warmer if ever there was one. 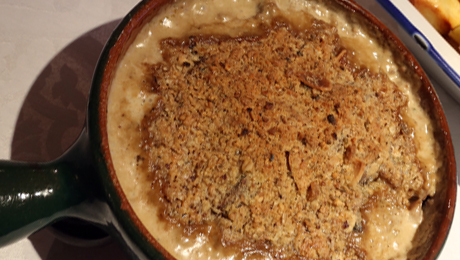 This mushroom & bacon crumble is just scrumptious! Into hot pan put Bacon, Shallots and Garlic, saute together until cooked. Add mushrooms, herbs, mustard and seasoning. Cook for another 2/3 mins. Add Lemon Juice and cream, heat through, check for seasoning and divide into 4 Ramakins (use as a starter) or 2 main course oven proof dishes. Sprinkle with prepared savoury crumble mix. Bake in hot oven 190/200 for approx. 20 mins until bubbling and golden. If you are having this as a main course serve with a side salad and some hand cut oven chips. A variation of this can be done with fish. Replace Bacon and Mushroom with diced fish chowder mix. Sauté fish off in a little butter and add other ingredients and cook as above. Or you can do a tomato one as a veg dish. Halve large vine tomatoes and scoop out just a little of the middle. Sprinkle with crumble mix, drizzle over a little olive oil and bake until golden brown. Amazing cold when all the juices of the tomato gets into the crumble.